January | 2010 | Another Beautiful Day in Paradise! It’s been a busy week here at Casa Poolman. Our Baptism demonstration for our CCD students went great Wednesday night. We had roughly 100 kids witness the celebration. They were extremely well behaved and attentive. Monsignor C did a super job explaining each step of the ceremony. The baby’s family seemed to get into it. Having that many young “honorary God parents” didn’t seem to detract from the impact of the event. Even young Kieran was calm and quiet most of the time. Now we have set the bar high for next year. We will need to be on the look out for a family that gets pregnant in the next few months and start working on them to provide their child for next year’s program. Sid the Cat is apparently not holding a grudge after our encounter yesterday evening. 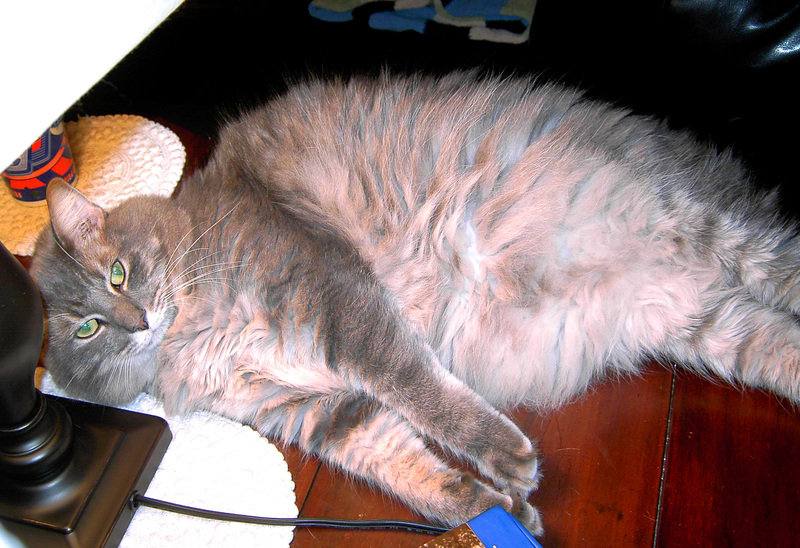 Sid is a large, long-haired, neutered, male Manx. (That means he ain’t got no tail.) Like most Manx’s, Sid likes to hang around near his “people” but he really doesn’t like to get real close. He likes to be petted, but he doesn’t like to be held and he definitely is not a “lap cat.” And after last night, I can also attest that he definitely does not like getting a bath. I noticed Sid had an issue when I walked through the room he was in and smelled him. Apparently, Sid didn’t take care of himself real well after using the litter box. He was hiding, but he wasn’t difficult to find. I just followed my nose. The good news is the only thing damaged was Sid’s dignity. I escaped without any scratches. After some liberal use of bleach to clean out the sinks, all was good. We still have some work to do this weekend to reassemble our home-office, but after that, Mrs. P says we are taking the weekend off. No argument from me. I can use a weekend of R&R before tackling the next project. Listening to the news on the radio while I drive to work is a great source of inspiration for blog material. They are fighting over burkas in France these days. 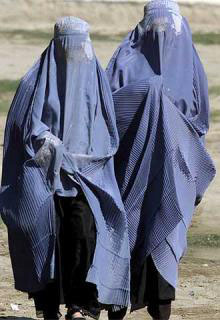 Those are the robes for Muslim women that cover their entire body including their face. France is considering banning them in public buildings, citing subjugation of women and security as the reasons. Naturally, those on the other sides are yelling about freedom of religion and France’s national identity. It’s interesting how Muslim leaders will cry for religious freedom when they are in the minority. However, try to wear a tee-shirt with “What would Jesus do?” written on it and see how far you get in the streets of Saudi Arabia or Iran. I suspect the mullahs would be singing another tune. A bill is scheduled to be introduced into the Georgia General Assembly today that would outlaw racial profiling. I am ambivalent about this issue. On one hand, I don’t think someone should be arrested or harassed because of the color of their skin. ie: driving while black, etc. On the other hand, crime is a serious issue in Savannah. Even out in our little suburban enclave, it is something to be concerned with. And at least here in Savannah, the vast, overwhelming majority of street crimes (assault, robbery, burglary, etc.) are committed by African Americans, primarily young, male African Americans. A story in yesterday’s local newspaper described arrest activity from the weekend and showed the mugs of the 12 people arrested. Ten of the twelve were black men. Unfortunately, this is not an anomaly. This brings me back to the initial question: Do I want to take away from the police one tool that might help them keep myself, my home and my family safe? I don’t know. 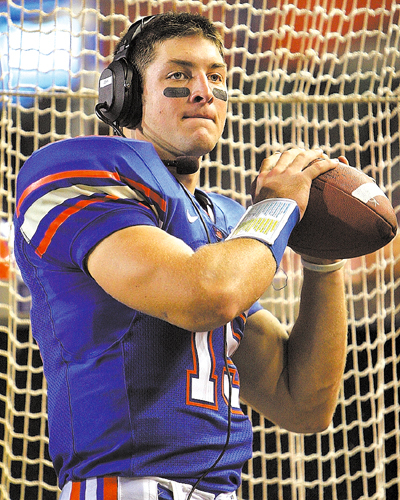 Our favorite-son quarterback, Tim Tebow, is taking hits this week, and not just at the Senior Bowl practice in Mobile. He and his mom are going to appear in a anti-abortion Super Bowl commercial paid for by the Christian advocacy group “Focus on the Family.” Supposedly, the ad will have Tim and his mom talking about her experience when pregnant with Tim. As the story goes, she had a difficult pregnancy and was advised to terminate the pregnancy for her health. She refused to do so, and the end result is Tim, a remarkable young man by any standard. I am not a big fan of Focus on the Family, for what little I know about them. Nor have I seen the TV spot, but then again, neither had anyone else. Nonetheless, the Women’s Media Center, with backing from the National Organization for Women, the Feminist Majority and other groups, are throwing the penalty flags in Tim’s and CBS’s direction. “An ad that uses sports to divide rather than to unite has no place in the biggest national sports event of the year – an event designed to bring American’s together,” said Jemhu Greene, president of the Women’s Media Center. “…an event designed to bring American’s together”??? I thought it was an event designed to determine the champion of the National Football League, provide an excuse for some Sunday afternoon parties and to make a lot of money for a bunch of people. I never knew it was supposed to be some kind of national unity event. Silly me. I wonder if Ms. Greene has ever been to a viewing party or a football game where there were decent percentages of fans of both team? (Super Bowl, Florida-Georgia, Texas-Oklahoma, a BCS championship game, etc.) I suspect she has not. If she had ever actually been to one of those games, she would know that unity is not a concept that comes to mind. I don’t believe the women’s advocacy group really have much to complain about except that the Tebows’ message will probably be something they will disagree with. The funniest shot comes from SI.com’s Greg Doyel. The irony is just pure honey. According to Doyel, Super Bowl Sun– “Thou shalt keep holy the Lord’s…” –day is too holy to be despoiled by any talk of morals, ethics, or, God forbid, religion. No further comment is necessary. For myself, it just gives me something to look forward to watching the game. This was a rough morning. I am functioning on about three hours sleep, which is at least four hours less than I need to be on top of the game. It was not a good night. The first problem was my own darn fault. I had two cans of Pepsi Max during the evening. The caffeine had me awake and alert. Our dog, “Casey the Lab,” is weather-phobic. Lightning and thunder drive him around the bend. Even heavy rain and winds cause him to have an anxiety attack. Last night, it wasn’t a major storm, but about the time we went to bed it started raining and the wind picked up. The darn dog would not settle down. He kept panting loudly and pacing around our bedroom, with his nails making scratching noises on the new floor. Occasionally, he would try to jump up into bed with me. Then the power went off and that made him even crazier. Finally, around 3:30 am, Mrs. P had had enough of it and went out to the family room to sleep on the couch. She took the big doofus with her. She is not working today. I hope she can catch up on her lost sleep. We can see the light at the end of the tunnel. Our month-long project to remodel our master bedroom and lay new floors in the sleeping portion of our house is nearing completion. I spent just about all day Saturday completing the quarter-round in the three non-master bedrooms. I am so appreciative of my friend Birdie who loaned me his power-mitre-table saw. I can’t imagine doing all that cutting and trying to get it to match using one of those little yellow plastic mitre boxes. The good, and somewhat surprising, news is that at no time did I come close to sawing off one of my fingers. That’s always a concern when I’m around power saws. I came up about an hour short Saturday afternoon, but I had to break to get ready for dinner. Writer Princess’s birthday is this week and we had her birthday dinner Saturday evening. WP has always had “birthday envy” of her brother who has a June birthday. She has always wanted a summer birthday because it would have opened up more celebration opportunities (ie: pool parties, picnics, cook outs, etc.) That envy was reflected in her choice of menu. She must think it’s the Fourth of July. We had a great evening. It was just family, which included, of course, Son-in-law and Poolboy’s serious GF. On Sunday, I spent about an hour finishing off the last of the quarter-round and then Mrs. P and I took off shopping for a bed spread and some sort of window treatment for our bedroom. We lucked out on both. We found a comforter at a big box store that isn’t perfect, but is pretty good and very inexpensive. It will cover the bed at a low enough cost until we find the “perfect” fit. Mrs. P and I kept going back and forth on window treatments. We ended up wit faux-wood “slat” venetian blinds. We installed them when we got home. The room looks completely different and great. I’ll post a picture when we get the pictures back on the wall. I just finished writing a sympathy note for the mother of a friend. It is sad when anyone dies, and their family feels the hole left in their lives. However, some deaths are more tragic than others. I’m sorry for her daughter and her loss. Mathilde has left a bit hole in her life. However, if I make it to 91 and am still going as strong as Mathilde when I check out, you won’t hear me complain. Rock on, baby! Life has been busy at Casa Poolman. Our house is still in total disarray, but there is a light at the end of the tunnel. We actually slept in our own bed last night, for the first time in about three weeks. First, let’s back up a little. Our Baptism demonstration did not come off last week in my CCD class. Our family with a newborn baby has agreed to allow his Baptism to be the subject of the program. They will bring the baby, god-parents, etc to the Wednesday night CCD session on January 27. They couldn’t get it together in time for last Wednesday’s class, which is understandable. What’s the deal with original sin? What happens to a baby who dies without being baptized? Why don’t priests get married? I’m looking forward to the “big event” on the 27th. Should be interesting. Work on our house continues. We had a three-day weekend and Mrs. Poolman and I used every minute of it, or at least it felt like it. Earlier in the week, Mrs. P and daughter, Writer Princess, went to that large home improvement store and bought ten, 16-foot lengths of quarter-round. From what they say, it was quite an adventure to get home with about half the length sticking out the back of Mrs P’s Honda CRV, and Writer Princess laying across the inside end of the pile to keep it all from dropping out onto the roadway. By Sunday morning, it was stained and finished and ready to be installed. A few hours work, right? No such luck. A professional crew might have handled it that quickly, but as I have confessed in the past, professional home improvement workers and I have very little in common. I spent all day Sunday and Monday on my hands and knees (I am so fortunate to still have some old knee pads from volleyball days.) measuring, cutting (measuring again, cutting again) and installing quarter-round. When I ran out of steam Monday evening, I was out of material and about half done. I did get the bedroom completed, so Mrs. P and I were able to get our bed set up and some of our furniture back in. The family room still has boxes and bedroom-type furniture stacked to the ceiling, but things are slowly starting to return to normal. Maybe one more Saturday, and I’ll have the job complete. My life has been in disarray this week due to the installation of new floors in the bedroom section of our house. Mrs. P and I have been sleeping on the family room couches because all our beds are disassembled and stashed in the living room or the main bathroom (Really!). All that is a long way of saying that I haven’t had the opportunity to post much this week. The IT guys at work frown on my doing it there, and my home computer has spent most of the week broken-down and sitting on the fireplace hearth in the family room. I have enjoyed watching the whole University of Tennessee – Lane Kiffin fiasco. What a piece of work! Charles Barkley was quoted with a great explanation for Lane’s inexplicable rise to head one of the nation’s premier college football programs.